Optometrist, Dental Technician, and other posts. Interested candidates can apply before the closing date of 28-11-2018. Application form is available for download at www.angul.nic.in. 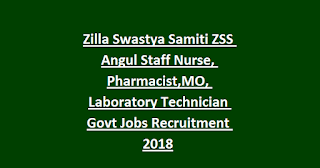 Candidates selection is based on merit in qualification and Skill Test for this ZSS Angul District Staff Nurse Recruitment 2018. 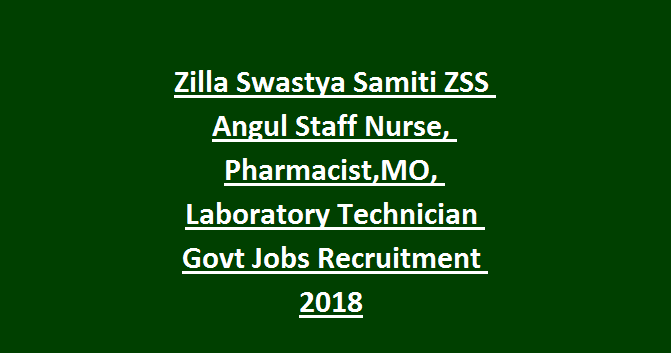 Age limits, qualification, application process, selection procedure and other details are given below for this Zilla Swasthya Samiti Angul Staff Nurse recruitment 2018. There are total 72 posts are in this ZSS Angul District recruitment 2018. Post wise qualifications refer official notification. Selection process for this ZS Angul vacancies will be based on merit in qualifications and skill test. Interested candidates can apply before the closing date of 28-11-2018. For some posts candidates have to attend the walk in interview.